Knowing the condition of your anilox rolls allows you to better run your production by helping you determine when to clean your rolls and when to replace them. Visually inspecting your rolls at the cellular level will also help you pin point problem areas due to wear and damage to ceramic or chrome surface. The AniCAM 3D Scanning Microscope is a state-of-the-art microscope which allows you to measure and capture images of cell volume variance, cell depth, wall thickness, opening dimension, screen count, engraving angle and much more. The AniCAM 3D Scanning Microscope with Anilox QC Application is used for analyzing ceramic anilox rolls with hexagonal cells (screen counts from 100 to 1200 lpi | 40 to 475 lpcm). Measuring covers relative cell volume, cell depth, cell diameter, wall width, screen frequency and screen angle. Complex Engravings – For measurement of non-hexagonal closed cell structures, and for open structures such as tri-helical engravings, elongated and GTT engravings. Comparison Report – Additional report generator allowing comparisons between two readings (i.e. Before/After Cleaning) to print on one report sheet. AniCAM Certification Package (ACP) – A mathematically proven X/Y & Z and volumetric measurement standard for calibrating the AniCAM and its application (consisting of an aluminum plate with embedded spheres and software program for AniCAM diagnostics and certification. Roll Stand – The solid Troika non-slip rubber support stands help safely position and steady an anilox roll or gravure cylinder for a secure reading or inspection. MagneCAM Option for ON-PRESS Analysis – This option incorporates magnetic legs and internal drive couplings for positioning the AniCam on steel cylinders or rolls with a minimum diameter of 4” to take measurements at a rotation angle of 120˚. X-Axis Micro Adjuster – The AniCAM X-Axis Micro-Adjuster option has been developed to allow users to move the camera 10 mm (±5 mm) along the x-axis to assist in finding specific engraved cells. The option includes Teflon tape to put under the radial lighting foot which prevents damage to a cylinder when the micro-adjuster moves the analysis head across the surface. Warranty: 12 months return to base warranty for hardware. *Minimum supported cylinder diameter is 3.2”. Y- Axis Micro Adjuster – The AniCAM Y-Axis Micro-Adjuster option has been developed to allow users to rotate the camera unit around the y-axis of the cylinders to assist in finding specific imaged dots and/or shapes. The option includes Teflon tape to put under the radial lighting foot which prevents damage to the plate/sleeve when the micro-adjuster moves the analysis head across the surface. AMS 75* – Anilox Management System (supporting up to 75 Anilox rolls): The software package for managing the complete Anilox inventory can be linked to the Anilox QC application and allows the user to be aware of the condition of each roll at any time, helping to improve press setup time, production and profitability by reducing ink adjustment. *This option is only available for AniCAMs with the MagneCAM option. AMS 150 – Anilox Management System (supporting up to 150 Anilox rolls): The software package for managing the complete Anilox inventory can be linked to the Anilox QC application and allows the user to be aware of the condition of each roll at any time, helping to improve press setup time, production and profitability by reducing ink adjustment. 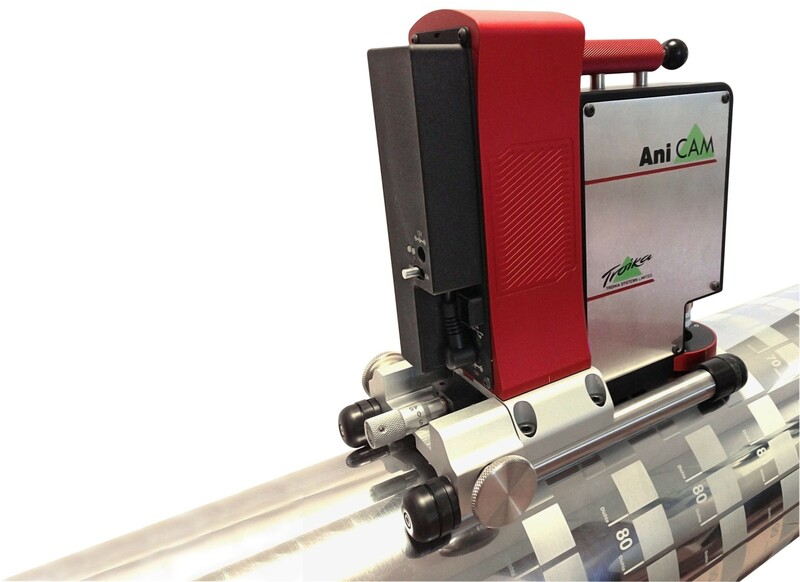 AMS UL – Anilox Management System (supporting an unlimited number of Anilox rolls): The software package for managing the complete Anilox inventory can be linked to the Anilox QC application and allows the user to be aware of the condition of each roll at any time, helping to improve press setup time, production and profitability by reducing ink adjustment.